This is a delicate proposition, and you want to find the tools that will serve them in later life. Trying to rush, trick or terrorize kids into a particular belief system is counterproductive. To quote Lady Macbeth, pace Hieronymus Bosch, “'Tis the eye of childhood that fears a painted devil.” Many of my contemporaries are still recovering from early religious instruction, which prioritized that doing one thing or another would land them in Hell. Besides turning people off, this tack misses the point. Fear might keep you from sin, but it makes you too timid to be much use. Does Hell exist? Is it anything like Cleveland? Perhaps, but damnation is only one part of God’s story. For me, the handiest definition of Hell is existence without God. If you’re going to teach kids about our relation to God, why get hung up on that unpleasant bit? A preferable approach is to let kids know they matter. “Let the little children come to me,” a good fellow said, adding that anyone who harmed a child was in for a world of trouble. You can never be too small for God to use, but you can certainly be too big. This message matters to kids and, imparted properly, will stay with them when they grow up. So, how to do this? Religion, like life, is one big best guess. Some folks think they have the answers, including believers and non-believers alike. Whenever one writes a column like this, one hears from doctrinaire adherents, as well as angry atheists (who, it seems, not only don't believe in God, they also don't believe in spell-check). Ironclad certainty in the face of the infinite cosmos is absurd, even with the Scriptures or Richard Dawkins on your side. But if you give kids the rudiments, explaining what you believe and why, they have the tools to make choices and adapt. 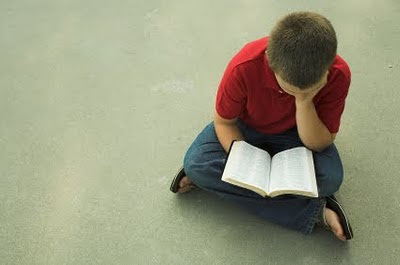 As the adage goes, “A scholar is always made alone.” Eventually, a child will have to make his or her own decisions. They must attune to that compass we all possess, which points toward what is right, and not deny it exists. Shine your light, be an example, and if people want a piece of what you’ve got, more the better. For my part, I am Presbyterian – which is very much like being Christian, only Scottish – and my faith is based on sacrifice for others and the suppression of self. In particular, I believe each of us is so important that God came to live among us, and to die, in order to reunite us with Him. Come to think of it, those are just about the only things I can tell you with any conviction about my religion. Where, exactly, Jesus was born, what he looked like, etc., are unknowable, and even the Gospels are at odds on such things. Details aside, I choose to believe the larger truth. That is not so simple as it sounds. Lest we forget, it was Jesus' message that got him killed. Then, as now, people had very definite ideas about how God should be. When Jesus was not as they expected, unpleasantness ensued. Whatever your religious faith (or lack thereof), how many of your most cherished assumptions could you stand to see overturned? Jesus said, "Whoever does not receive the Kingdom of God like a child shall not enter it." That is an enchanting yet foreboding remark, but what does it mean? If I had to give my best guess at an interpretation, I’d say: Be open. We are all someone's children, and we are not in charge. That, in itself, is an encouraging thought. I have seen too many of us wearing socks with sandals to suppose humankind has all the answers. Fortunate children preserve their sense of wonder and openness into adulthood. The best thing to teach them is to be willing to see and ready to believe. Willis McLeese has accomplished a lot in his first 96 years. 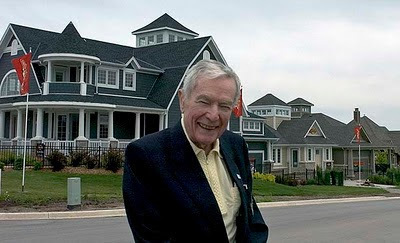 From his WWII service in the Navy, to his legendary and lucrative careers in refrigeration and power, to the resort community he is building at Cobble Beach, Ontario, he has made the most of every moment. Along the way, he developed a myriad of skills, from thermodynamics to time management (a must, for someone who runs several companies). But a key lesson McLeese learned through his many experiences is: The power to persuade is essential to success. For all his philanthropic efforts, the cause to which McLeese has been most devoted is helping young people learn the craft of persuasive speaking. He has laboured at this for almost 40 years, particularly in support of the Canadian Student Debating Federation (CSDF). Most recently, he endowed the Willis S. McLeese Chair in Canadian Debating, based at Upper Canada College in Toronto and working with the CSDF, to bring young people across the country into this activity. The program is outlined at mcleesedebate.com. McLeese’s belief is that if students are given the skills and confidence to speak publicly and advocate positions, it will serve them well later in life. “Debating is a way to extend your influence,” he avers, adding, “Canada will always need great leaders.” He notes that being a leader doesn’t require your name on a ballot. Leaders come in all sorts, in every profession. What they share is the power to convince and inspire. A small percentage of student debaters will grow up to be politicians or trial lawyers (at least, one hopes it’s a small percentage). But whatever careers kids pursue, someday they will have to answer questions like: What makes you different? Why should we do it your way? Why should I buy what you’re offering? So much of life, and success, is about selling ideas. From Clarence Darrow to Don Cherry, if you can make a case, you can make a living. Teaching young people this craft is practical education at its best. In a rare deviation from the shrewd judgment that made him a success, McLeese has asked me to take up the Chair that bears his name. My early debating made it possible for me to opine in the public square (for better or for worse), and one hopes I can help offer today’s students the same opportunity. Our first step is a partnership with Rudyard Griffiths and his famed Munk Debates, commencing this spring. But whatever contribution I might provide, it could never compare with that of Willis McLeese, an extraordinary patron of the art of argument. Theo Caldwell is the McLeese Chair in Debating. Sunday’s Super Bowl is not just a contest between two football teams. This year, there is an undercard, featuring a clash of beliefs about life and choice. Tim Tebow, the Heisman Trophy-winning quarterback for the University of Florida, is set to appear in a pro-life commercial during the game, along with his mother, Pam. The ad tells the story of Pam’s difficult pregnancy, in which she contracted an infection and was advised to abort Tim. Pro-choice activists claim that the ad, paid for by the Christian group Focus on the Family, could lead to violence and have been pressuring CBS to keep it off the air. The broadcaster has said the commercial will be shown, but the imbroglio begs the question: Can the abortion fight ever be resolved? In Canada and the United States, folks are fond of saying the issue of abortion is “settled,” pointing to rulings by each country’s Supreme Court, in 1988 and 1973, respectively. But the decades of turbulence over this matter have taught us that something so emotional and elemental is not “settled” by a few lawyers. Other news from recent days proves the point. In Kansas, the trial of the man accused of killing late-term abortion provider George Tiller began on January 22, the 37th anniversary of the U.S. Supreme Court’s Roe v. Wade ruling (Scott Roeder was convicted of Tiller’s murder one week later). At the same time, a new Marist poll shows a majority of Americans, and nearly 6 in 10 young adults, see abortion as morally wrong. "A large majority of Canadians (79%) would back an initiative in their own province that would make it mandatory for health care workers to offer information to pregnant women about alternatives to abortion." It is often said that it is more effective to change hearts than to change legislation. In this case, while the finding speaks of a “mandatory” initiative, the underlying sentiment may, in fact, be most helpful. To wit, while abortion may never again be illegal, it is broadly undesirable. Common parlance bears this out. Politicians who believe abortion should be available any time, for any reason, rarely speak in plain terms. They talk of “choice” and “reproductive freedom” and “women’s rights.” Indeed, it would take a hard person to say that abortion, as an act, is a good thing. If we can agree on that, it means most of our hearts are in the same place. So, what if we agreed that, as long as public money subsidizes abortion, an equal or greater amount should go toward a mechanism to find homes for unwanted babies? If you really wanted to be controversial, you could add a bit about preventing unplanned pregnancies in the first place – that is, letting young people know that abstinence isn’t only about Bible-thumping and promise bracelets – but that might be too big a leap right away. For now, let’s just suppose that citizens made it a priority that every little person gets a chance at life and no young woman goes through the misery of abortion. This is less a function of writing laws than of changing priorities. Nothing gets banned in this scenario, but possibilities are opened. If we shift our default response to an unwanted pregnancy from contemplating abortion to offering support, great things could happen. Add incentives for religious and private-sector organizations to provide money and means for young mothers who want to raise their babies themselves, and we’re starting to get somewhere. Again, if we stipulate that abortion itself is a tragic act, wouldn’t a robust and ubiquitous network of alternatives be helpful? When you offer people good choices, bad laws become irrelevant. The hardship of anyone contemplating an abortion is something that cannot be denied. Pam Tebow knew this fear all too well. And the perspective from which the decision is undertaken makes all the difference. Folks can always choose, but with love and support, it becomes easier to choose wisely. What a wonderful thing that would be for women and families. And, not for nothing, millions of little people would get a chance at life, with all the choices it has to offer.